The letter I chose for Alphabakes this month was D – I really wanted to make doughnuts but didn’t get the time! Thanks to everyone who found time to bake or remembered an old blog post to send in. Kicking off the tea time table was Kerene aka The Dream Baker, who made these Danish butter cookies. I remember often having a tin of these sweet sugary biscuits at Christmas as a child but they would be great at any time of the year. 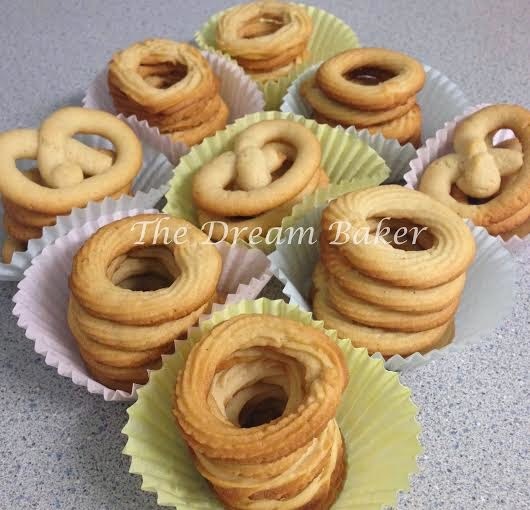 She gives some useful tips at the end of the blog post about what she learnt from experimenting with this recipe and the results look very moreish. 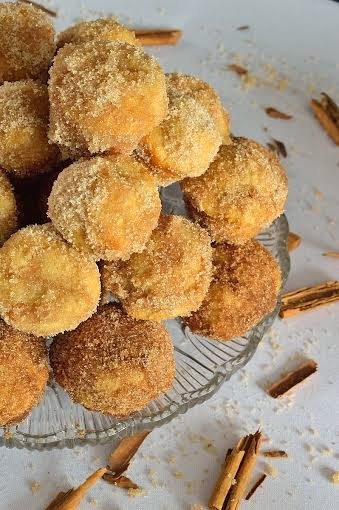 Michelle at Utterly Scrummy has made me quite jealous this month with her cinnamon sugar mini muffin doughnuts, I will have to try this recipe! They use Greek-style yogurt and are baked rather than fried, so they actually seem relatively healthy. 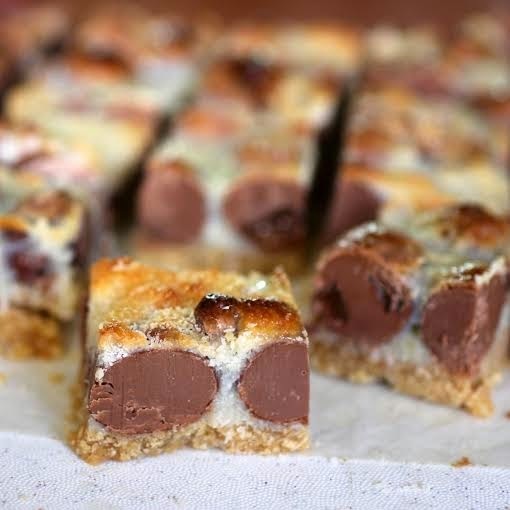 Dessicated coconut is the D ingredient in this Easter Egg Slice from Johanna at GreenGourmet Giraffe. You can use a bar of chocolate if you don’t have any Easter eggs left by now! Johanna said these taste amazing and to have a light dinner if you are making this as dessert as you won’t be able to stop at one piece! 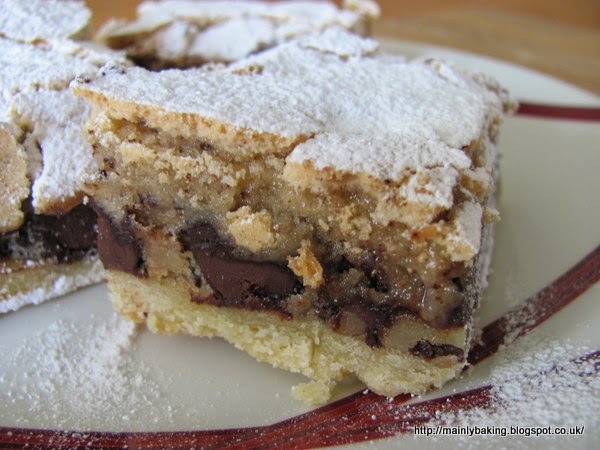 I made this Doberge cake – apparently a New Orleans classic. It came from a book of desserts from the city, which my boyfriend’s mum bought me when she went there, so I made the cake for her birthday. It looks a little strange – read my full post to understand why – but I can assure you that it tasted absolutely amazing! From a classic to something I’ve never heard of, Derby Squares. 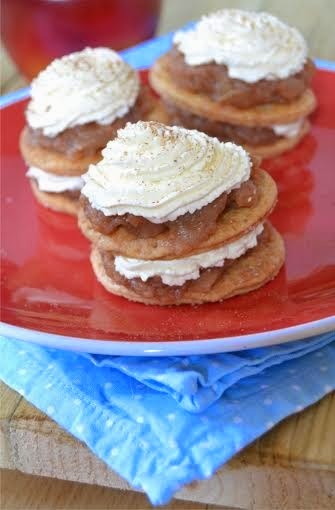 They were sent in by Suelle at Mainly Baking who explains the recipe is based on Kentucky Derby Pie, which is similar to pecan pie but uses walnuts. 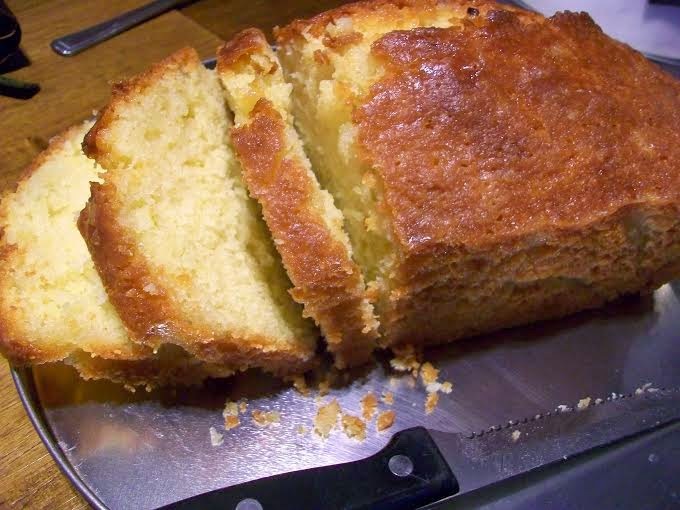 Suelle says her recipe didn’t turn out too well, as the top baked hard so looked cracked when the slices were cut. Some of the nuts and chocolate also sank – but I think as long as it tastes good, it doesn’t matter what it looks like! 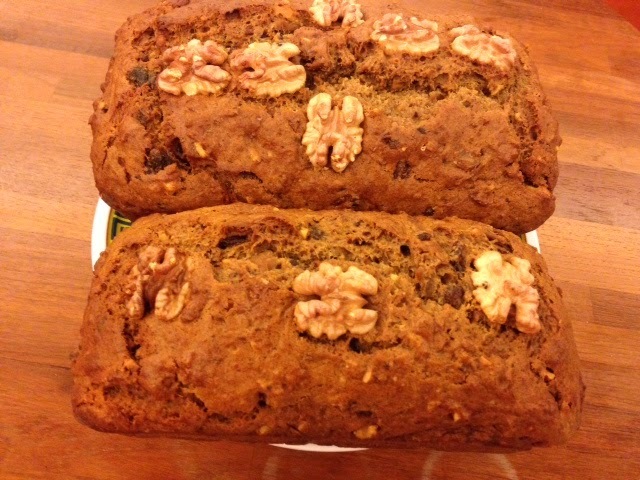 Ros’s mum sent in this date and walnut loaf, which her brother pronounced D was for delicious! 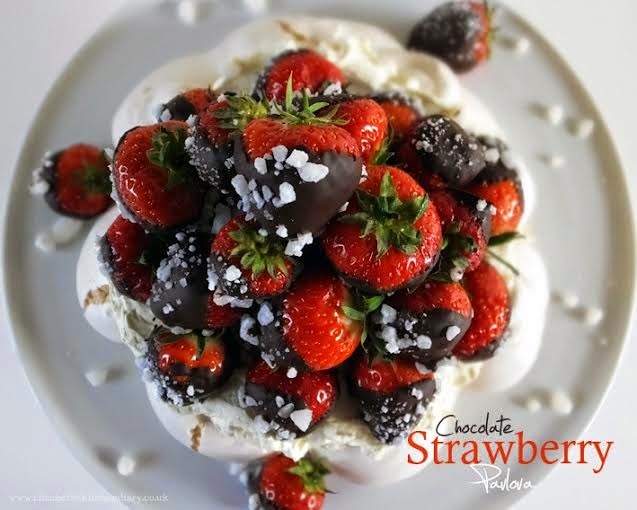 Next up we have a chocolate strawberry pavlova by Elizabeth from Elizabeth’s Kitchen Diary. The D is for dark chocolate; this was born of a late-night desire for something sugary. She uses homemade rhubarb saffron sugar which sounds interesting, and I find it hard to believe this is Elizabeth’s first ever pavlova, as it looks great! Dark chocolate was also the ingredient chosen by Choclette of Chocolate Log Blog. 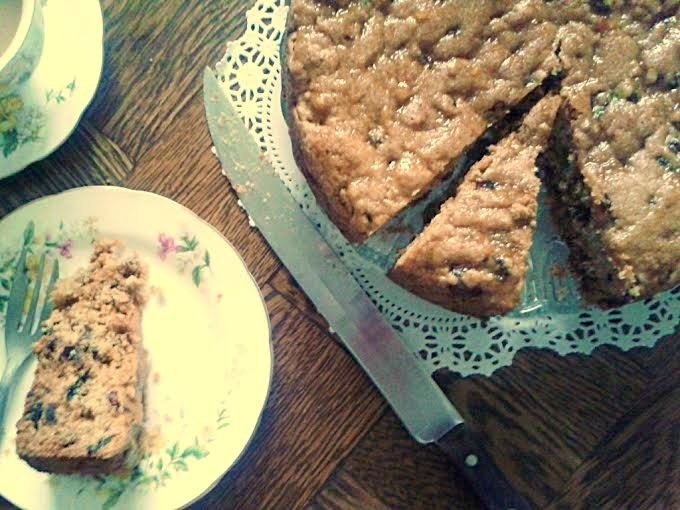 She made a ‘free from’ cake that has no gluten, dairy, eggs or sugar. 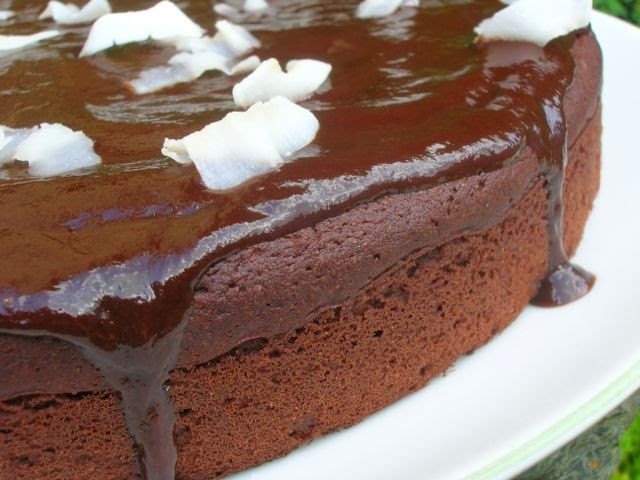 Instead it uses coconut oil and chickpea flour and is rich and flavoursome, Choclette says. 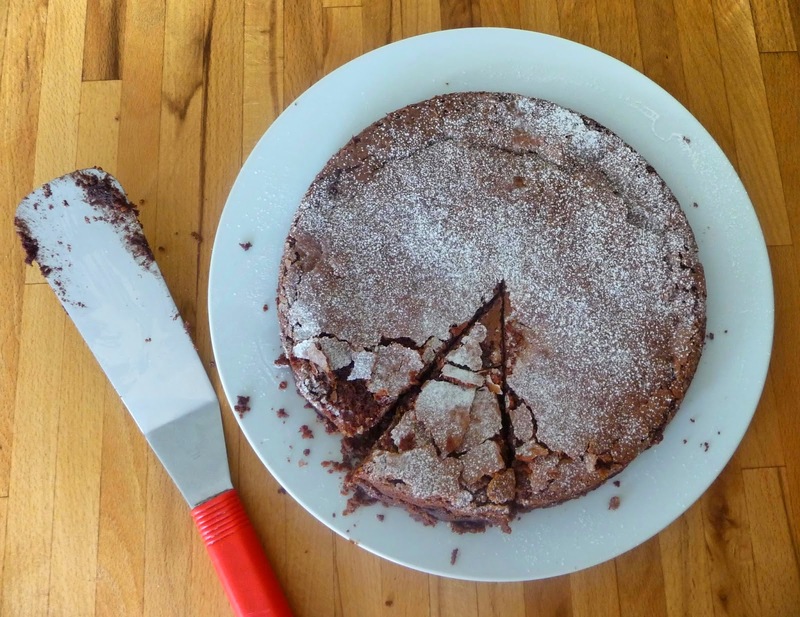 This amaretto chocolate torte is also gluten free, sent in by Linzi at Lancashire Food. She says it is light, moist and very chocolatey which is all I want in a cake really! 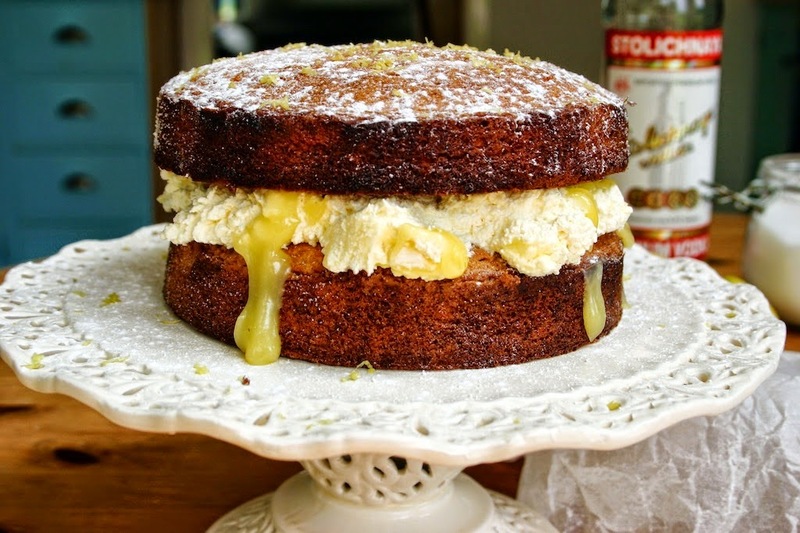 This luscious lime coconut drizzle cake comes from Jen at Blue Kitchen Bakes. The tropical flavours are great for this time of year and I’m sure many of us have a bag of dessicated coconut at the back of the cupboard, so this is a great way to use it up! Dominic from Belleau Kitchen has been a bit cheeky (Dom? Never!) and sent us this Stoli lemonade and elderflower eton mess Victoria sponge under the name “Dominic’s cake”. 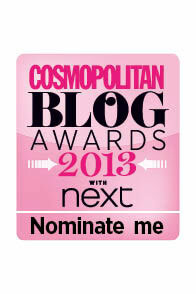 Luckily it looks so good that I had to include it in the round-up! It just oozes British summertime. 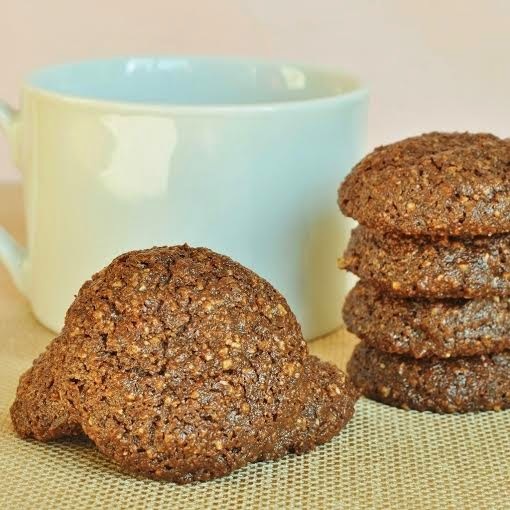 These date and cashew chocolate drops come from Alexandra, the Lass in the Apron. She has managed to find a use for some particularly bitter chocolate she bought, which gives the cookies a great depth of flavour. Kerene at the Dream Baker has sent us another submission, and informs me that it was national doughnut day at the beginning of June. How did I not know this?! 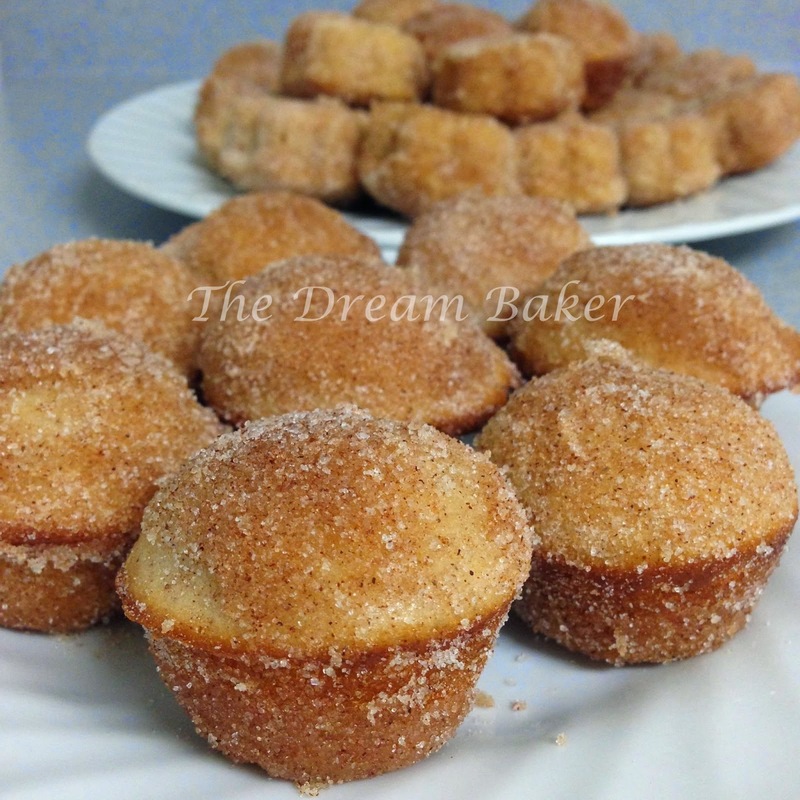 She made cinnamon baked doughnut holes, which sound delicious. I’ve been taking part in a challenge to bake and cook dishes from different countries that are taking part in the World Cup. I made this pionono – essentially a Swiss roll – from Argentina, which is filled with dulce de leche. I normally buy ready made dulce de leche but this time I made it from condensed milk. 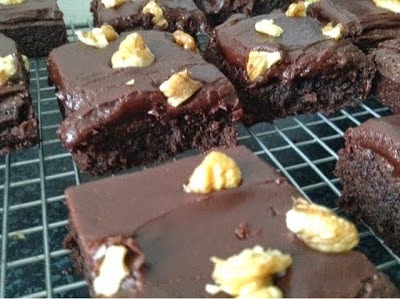 Finally we have Fiona from Sweet Thing You Make My Heart Sing with her fudgy chocolate squares, using dark chocolate. A lovely selection of bakes and treats - thanks to everyone who took part. My co-host Ros will be announcing the next letter on July 1st at The More Than Occasional Baker. Lovely round up, full of lots of recipe inspiration. I'll definitely be making the lime coconut drizzle cake! sorry i didn't get around to making anything this time. Lovely selection of D entries. 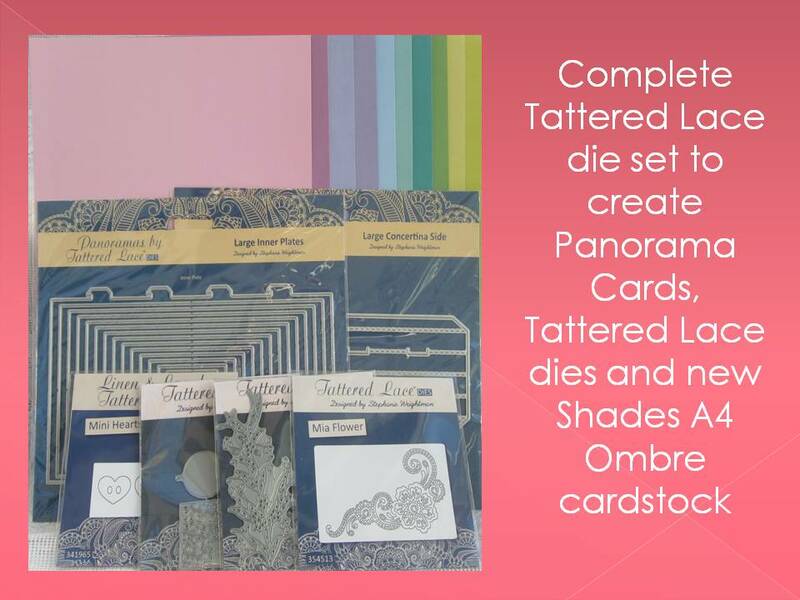 Great round up as always!